A couple of weeks ago, an appeal in defence of Polish schools in Vilnius was made to the Polish authorities. The appeal was issued to i.a. Marshal Marek Kuchciński. The appeal was signed by the leader of the Association of Teachers of Polish Schools in Lithuania “Macierz Szkolna” and Deputy of the Seimas of the Republic of Lithuania Józef Kwiatkowski, Renata Cytacka on behalf of councilmen from Electoral Action of Poles in Lithuania, and Danuta Narbut on behalf of the Forum of Polish Parents in Vilnius. In response, the head of the Polish Parliament thanked the senders for providing detailed information on the problems associated with the functioning of Polish schools in Lithuania. “These issues are really close to me. In September 2015 I visited Vilnius as Deputy Marshal of the Sejm of the Republic of Poland to closely observe a protest in defence of Polish education in Lithuania.” – the Marshal said, confirming his knowledge of Polish minority issues in Lithuania. The Marshal assured that the situation of Poles in Lithuania, especially in terms of education, is of great interest to the Polish Parliament. “The situation of the Polish minority in Lithuania, especially the implementation of the law to teach in the mother tongue, is – and will continue to be – a subject of particular interest to the Sejm of the Republic of Poland. I would like to assure you that the representatives of the Sejm will, at every given opportunity and within the framework of bilateral parliamentary relations, touch on the subject of the Polish education system and the functioning of the Polish community in Lithuania. I hope that the efforts made by both Polish parliamentarians and the Polish government will bring the expected results and progress in solving problematic issues in terms of Polish-Lithuanian bilateral relations.” – wrote Marshal M. Kuchciński. 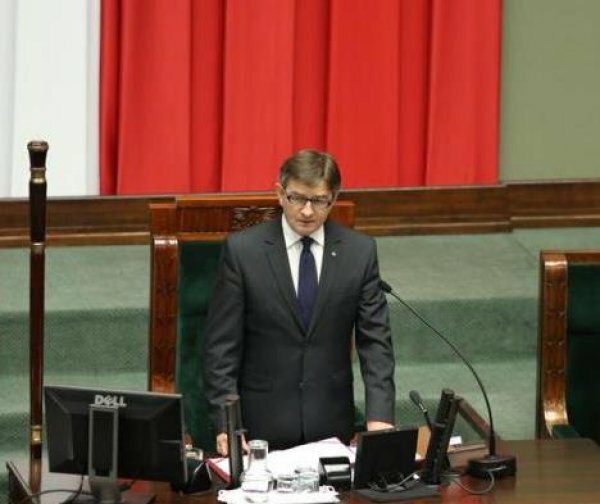 The head of the Parliament reminded that the function of providing tutelage to Poles and the Polish communities abroad will soon be granted back to the Senate of the Republic of Poland. “Simultaneously, I would like to inform you that the Senate will soon be returned to its traditional role of protector of Poles and the Polish community abroad. Polish educational establishments functioning in Lithuania can count on help and support from the Polish budget.” – he stressed. The Marshal thanked the active representatives of the organized Polish minority in Lithuania for engaging in the issues of Poles in Lithuania and the idea of ‘Polishness’. “I would like to take this opportunity, on behalf of the Sejm and myself, to thank you for your work and unwavering effort made for the benefit of Poles living in Lithuania, sustaining their connection with Poland and teaching the Polish language.” – thanked the Marshal of the Sejm of the Republic of Poland Marek Kuchciński.